Algas, dirt, and debris can contaminate your fuel and interfere with the proper functions of your unit’s core systems. We offer a variety of fuel services to keep your vessel running at top capacity. Fuel polishing services involve pumping fuel from the tank, feeding it through a filtration system, and returning it to your tank until the fuel is crystal clear. 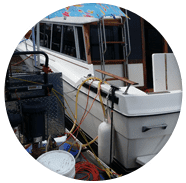 Once on-board, our technician will do a comprehensive evaluation of your fuel system and provide you with an estimate of the work that needs to be performed. Once you’ve approved the estimate, our technician will complete the job quickly and professionally and offer competitive pricing. To dispatch a highly trained and dedicated technician to your vessel’s berth on time, and ready to take on any task. We are experts in fuel systems and, have state-of-the-art tools that will allow us to take on any job.